Elden Henson (born Elden Ryan Ratliff; August 30, 1977) is an American actor. 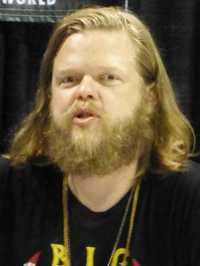 He is best known for playing Fulton Reed in The Mighty Ducks trilogy, Foggy Nelson in the Marvel Cinematic Universe and Pollux in The Hunger Games: Mockingjay - Part 1 and Part 2. This webpage uses material from the Wikipedia article "Elden_Henson" and is licensed under the GNU Free Documentation License. Reality TV World is not responsible for any errors or omissions the Wikipedia article may contain.